To feel the magic atmosphere of the ancient and, at the same time, advanced Moscow you should discover the city with your own eyes and legs. We suggest you to walk around the famous places in the center of the city. 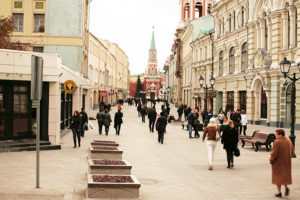 Arbat is considered the oldest pedestrian street in Moscow. The name of this street was first mentioned in 1475. What is so special about this place – museum, theater scenes, marketplace, and a place for walking? Arbat is a kind of a cozy world where you can immerse yourself in the amazing creative atmosphere. The street became pedestrian in 1986. Soon, the renovated street attracted artists, musicians, street performers and vendors, creating custom creative world within Arbat. Contemporary Arbat is something like the ‘Montmartre’ where you can see people draw, sing, dance, recite poetry, oratory and much more. Perceiving its noble and intellectual traditions try to feel the uniqueness and charm of this corner of Moscow. 1. 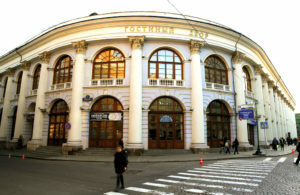 Start a walk along Arbat at its eastern end – Arbatskaya Square. Here you can see a XIX century building – a famous restaurant –«Prague». It has existed since the 1890s and always was a meeting place of the elite. The restaurant itself is now closed for a reconstruction. 2. 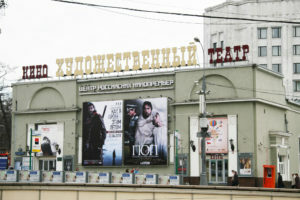 The restaurant overlooks «Khudogestvenniy» Cinema – one of the oldest cinemas in Moscow. It was opened in 1909. 3. Turning to Bolshoy Afanasyevsky Lane you will find the beautiful Church of Athanasius and Cyril of Alexandria. 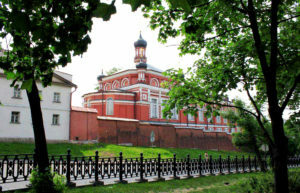 Following the lane, go to the Moscow State Museum «House of Burganov». 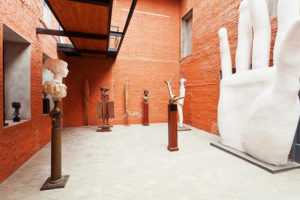 A part of its exhibition, by the way, is clearly visible from the outside, so you can choose either to observe it from a distance or to visit this museum. Coincidentally, you will see many works of this artist travelling along this route. Next, go along the Sivtsev Vrazhek Lane all the way to Denezhny Lane, and from there, you will arrive to the Arbat. 4.If you turn left to the Krivoarbatsky Lane, you will find one of the city’s most remarkable examples of Constructivist architecture, an idealistic and futuristic movement that swept the Soviet Union in the 1920s. 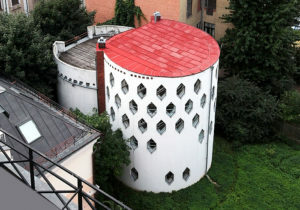 The Melnikov House is named after the architect who designed it in 1927. An experimental design, the house is formed from two connected cylinders and dotted with hexagonal windows. Plans to create a museum here exist, but even before that happens it is worth going to peer through the fence. Continue on Kirvoarbatsky Lane and turn right to go back to the Arbat. At the end of the lane, there will be the “Victor Tsoi Wall”, a one-of-a-kind tribute to the beloved musician. 5. 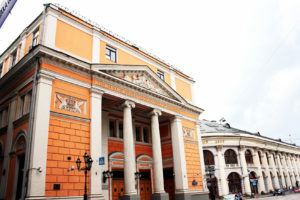 At the Arbat Street you will see the Vakhtangov Theater and 6 a small fountain with golden figure of Princess Turandot, the title character of Carlo Gozzi play, and the most celebrated production of this theater. 6. At the Plotnikov Lane, you will see bronze statue of Bulat Okudzhava, a famous Russian songwriter and singer, walks sure-footed to meet you. The sculptor G.V. Frangulyan did his best to recreate the spirit of the legendary Arbat so adored by the bard around this composition. 7. Head straight up Spasopeskovsky Lane to see the pretty Church of the Savior on the Sands (Spasa-na-peskah) dating the 18th century. At the far end of the lane is the elegantSpaso House, home of the U.S. Ambassador to Russia. Make your way back to the Arbat, and turn right to continue walking west. 8. 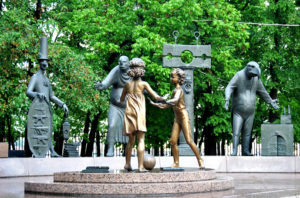 On the right, you will notice a bronze statue of Russian poet, Alexander Pushkin, and his wife Natalia Goncharova. 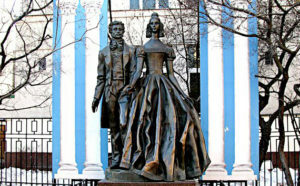 After their wedding at the nearby Great Ascension Church, the couple lived in the blue house on the left, which is now the Pushkin House-Museum. 9. The Arbat ends at Smolenskaya-Sennaya Square, which is dominated by the massiveMinistry of Foreign Affairs. This is one of seven skyscrapers known as the Seven Sisters, which were built in 1947 to commemorate Moscow’s 800th anniversary. 1. Start the walk from Kropotkinskaya metro station and follow the boulevards clockwise. You will find yourself at Gogolevsky Boulevard, the symbolic start of the Boulevard Ring. It stretched from Prechistenskie Gate Square to Arbat Gate Square. A striking feature of this boulevard is that it is a three-tiered – external, middle and inner parts are at different heights. There are many houses and mansions of the late nineteenth century. 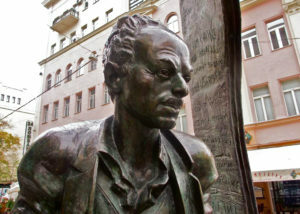 Almost in the center of the boulevard is a monument to Mikhail Sholokhov. 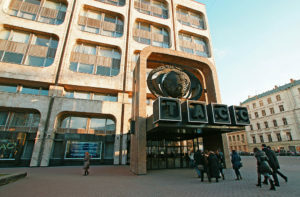 Two departments of Moscow Museum of Modern Art are located here. At the end of the boulevard, you can see a monument to Nikolai Gogol. 2. Coming over the Arbat Square, you will find yourself at Nikitsky Boulevard, with lots of beautiful buildings and nice cafes. The mansion of Count Alexander Tolstoy was situated here. The Niktitsky Gate completes the Boulevard. 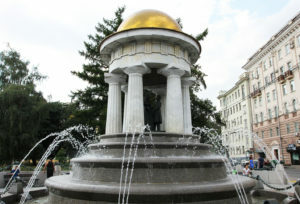 On your left, you will see fountain rotunda «Natalia and Alexander», established in honor of the 200th anniversary of Alexander Pushkin’s birth. 3. Moving forward you get to the longest boulevard of the Boulevard Ring – Tverskoy. 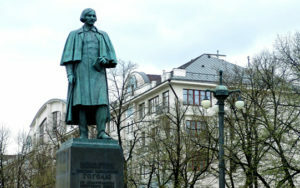 At the beginning of the Boulevard, you will see the monument to Timiryazev. Also, note the TASS building on your right. In the center of the recently renovated Boulevard is a monument to Sergei Yesenin. 4. Crossing the Tverskaya Street, you will get to the Pushkin square where you will see the writer’s monument. 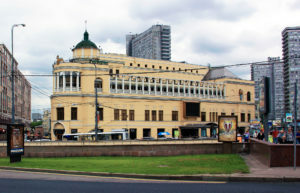 Right behind the Pushkinsky Cinema begins the Strastnoy Boulevard, the widest at the Boulevard Ring. Here you will find a monument to composer Sergei Rachmaninoff and a monument to the actor and poet Vladimir Vysotsky. 5. Strastnoy Boulevard ends by Petrovskiye Gate and Petrovsky Boulevard begins. Here you will find many architectural and historical monuments. 6. Rogestvensky Boulevard starts from the Trubnaya Square. 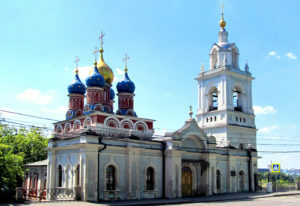 The history of this place begins with the appearance of female Rogdestvensky and men Sretensky Monasteries in the area. In 2012, worship the cross in honor of the patroness St. Euphrosyne of Moscow was established at the boulevard. 7. 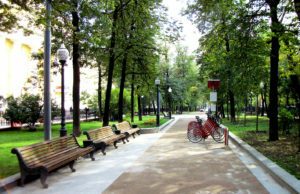 Go further to Sretensky Boulevard, the shortest boulevard of the Boulevard Ring. 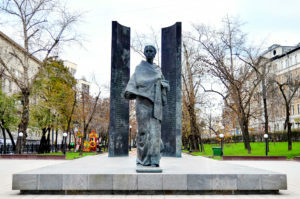 In the beginning of the boulevard is a monument to Nadezhda Krupskaya. 8. 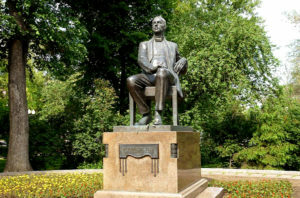 At the entrance to Chistoprudny Boulevard, you will see a monument to Alexander Griboyedov, and later – a monument to Kazakh poet Abai Kunanbayev. 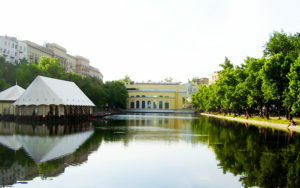 Chistoprudniy Boulevard is the only one at the Boulevard Ring where you will find the pond – “Pure ponds”(Chistie Prudi). 9. Coming through Pokrovsky Gates Square and Khokhlovskaya Square you will appear atPokrovsky Boulevard that flows into the Yauzsky Boulevard. They are not so well known as Tverskoy or Chistoprudniy Boulevard, but they are also quite remarkable. 10. Ustyinsky drive completes the Boulevard Ring. 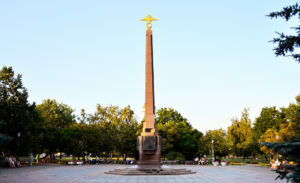 Here, in the Yauzskie Gate park area you will find a monument to Motherland Border Guards. Perhaps we have not told you everything about the Boulevard Ring. Just have a walk right at the border of unpreserved White City and see wonderful nowadays Moscow through one of its best parts. 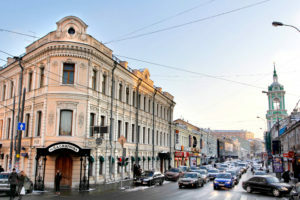 Kitai-gorod is one of the oldest and the most interesting areas of Moscow. It was a commercial and business district in the years before the Revolution. Here you will see traces of medieval Moscow. 1. Start your walk right at the Kitay-gorod metro station. 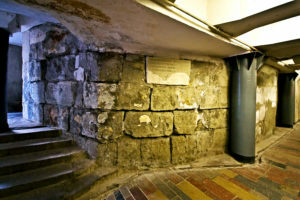 In the wall of the underpass, you will see fragments of the foundation and the base of the Varvarskaya tower of the Kitay-Gorod. Kitaygorodskaya Wall was built in Moscow in the 1530s by architect Petrok Maly. It had 14 towers and was more than 2.5 km length. The Wall began from the Arsenal Tower and ended at Beklemishevskaya Tower of the Kremlin. It was almost completely demolished in the 1930s – 1950s. 2. Go to Varvarka Street, into the area of the former medieval fortress.The street is real reserve of old Moscow: ancient temple of St. George on Pskov Hill, the cathedral of the former Znamensky Monastery and Chambers of the Romanov Boyars are situated in the street. 3. 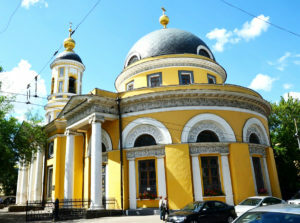 If you go to the Ipatievsky Lane on the opposite side of Varvarka, then at the corner of the Nikitinskiy lane you will see the beautiful temple of the Trinity in Nikitniki of XVII century. 4. Return to Varvarka and continue. To your left you will see one of the oldest buildings in Moscow – Old English Court, built in the late XV century by merchant Ivan Bobrischevym. On your right, there is Gostinniy Dvor. The first mention of it dates to the beginning of the XVI century, and at the end of XVIII century, it was rebuilt by architect Quarenghi. 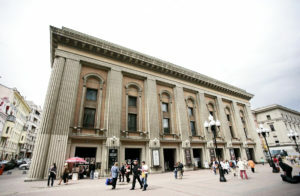 Now it hosts an exhibition hall, shops, restaurants and cafes. 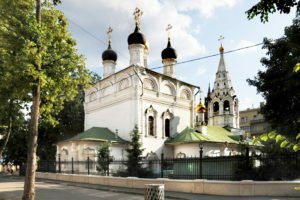 Not far from Gostinniy Dvor, Barbara the Martyr Church, which gave its name to the street, is located. 5. Turn right to the Crystal Lane (as you might guess, there used to trade crystal and glass)and go on to Ilyinka Street. The street is named after the ancient Elias Monastery. It was abolished, and the Church of Elijah the Prophet was built in its place. Follow the Ilyinka Street to the Burse Square. Exchange building (now a CCI of Russia) is on your right. 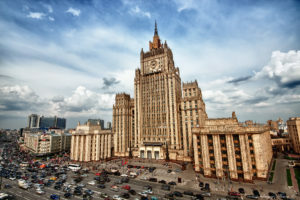 Like a hundred years ago, it is – one of the main business areas of the capital: ministries, banks, representative offices of various companies. Many buildings have preserved from pre-revolutionary times. Near the Burse Square a beautiful Epiphany Cathedral of the Epiphany Monastery – one of the oldest in Moscow is located. 6. Reaching the Big Cherkassky Lane, turn left and walk along the early XIX century buildings to Nikolskaya Street. It is, perhaps, the busiest street of Kitay-Gorod. At all times it was one of the main streets of Moscow. There is a wide variety of shops, malls, restaurants, cafes and clubs. 7. Nikolskaya Street has always been famous for many bookshops. In the beginning of the XIX century, there were 26 out of 31 Moscow bookstores! 8. Go by the street towards the Kremlin. 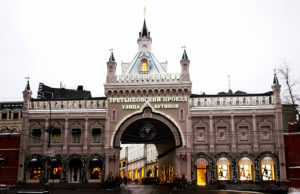 Right in the arch – Tretyakovsky Passage – a street with fashionable shops of famous international brands. This passage was arranged in the 1870s Tretyakov brothers. The Building in the Gothic style, with a sundial, bas-relief images of a lion and the unicorn is a former Synod printing. The house was built in the 1810s. Here, in 1564 the first Russian printed book “The Apostle» was published. Russian State Humanitarian University is now located here. Walk along the Nicholskaya Street and get to the Red Square, from where you can start a wonderful study of the Moscow Kremlin. The Zamoskvorechye District, located at the lower bank of the Moskva River, has almost undergone any renovation. 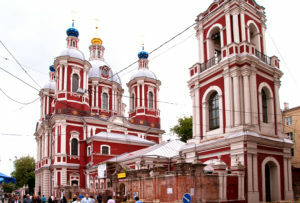 Varied in style, Moscow churches XVII – XIX centuries, the Exchequers and the homes of famous Moscow merchants retain the image of old Moscow. The first mention of the Zamoskvorechye in the documents refers to 1365, when first settlements began to form here. Since the second half of the XIX century, the area was popular among intellectuals. Outstanding figures of Russian culture lived and worked here. For example, young Lev Tolstoy rented an apartment in the merchant’s house in 1854-1855 in Pjatnitskaya Street. Fyodor Dostoevsky often visited his aunt in a house on Bolshaya Ordynka (known as Kumaninskoe farmstead). This area is closely associated with the names of Anna Akhmatova, the famous Russian publisher and educator Ivan Sytina. The Soviet era did not cause serious damage to Zamoskvorechye and despite modern development, here preserved historical architecture. 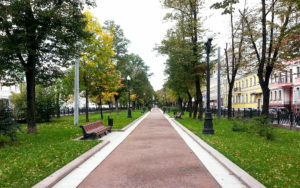 In 2013, a new pedestrian zone near the Tretyakovskaya Gallery, and includes Pyatnitskaya street Klimentovskiy, Ordinsky, Lavrushinsky Lanes and Kadashevskaya embankment, appeared in Zamoskvorechye. 1. Start a walk from Novokuznetskaya metro station. 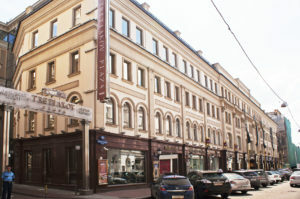 Go through Pyatnitskaya Street to the vintage Klimentovskiy Lane that connects Bolshaya Tatarskaya and Bolshaya Ordynka streets. 2. Here you can see a wonderful piece of the XVIII century architecture – the Temple of the Holy Martyr Clement, Pope (1762-1774). The northern side of Klimentovskiy Lane forms a small district occupied by shops and cafes. 3. Crossing Bolshaya Ordynka not forget to look in Ordynsky dead end, located right on your way.there you can see the Church of All the Afflicted. 4. 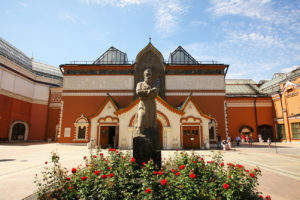 One of the main attractions of the pedestrian zone – The State Tretyakov Gallery is situated in Lavrushinsky Lane. The famous museum occupies the even side of the lane, called in the XVIII century by the name of the proprietor Lavrushina. 5.Going to the Kadasheskaya Embankment, you will cross the drainage channel by Luzhkov Bridge and find yourself on Bolotnaya embankment. Nearby, at the Bolotnaya Square, you can find sculptured composition by M. Shemyakin and monument to the great Russian artist Repin. Then you can continue your walk and visit the «Red October», there are many restaurants, cafes and Lumiere Brothers Photography Center.